The Rio de los Pinos droops below the southern border of Colorado like the bottom of a horseshoe. The Rio de los Pinos headwaters reside in the San Juan Mountains in southern Colorado. The stream flows south and then east through New Mexico for about 20 miles then crosses the Colorado border again. The New Mexico Department of Game and Fish manages part of this fishery–Rio de los Pinos Wildlife and Fishing Area on the east section of the river and is where the private property is located. The west end of the Rio de los Pinos holds rainbows, wild browns and brookies. Vegetation is heavy, near the banks, with tall grasses and willow trees. However, the stream is easily fishable and casting is generally not a problem. The lower end–east the Rio de los Pinos is accessed from Colorado, traveling down forest road 284, north of Ortiz and Los Pinos, New Mexico. There are several miles of access to fishing and campgrounds along the stream. There are several hatches throughout the season producing an abundance of insects for the fish to feed. You can catch large fish, and a lot of fish, even if you are novice at fly-fishing. Fishing this stream and its feeder creeks is an experience that you will remember for a long time. A portion of the stream through the Rio de los Pinos Wildlife and Fishing Area has special regulations. Take US 84 north to Chama to access the west end of the Rio de los Pinos from the railroad. Take NM 87 from US 285 to the Cruces Basin Wilderness for access to the Rio de los Pinos west feeder streams. 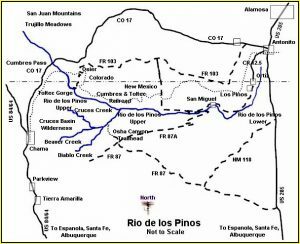 Take US 285 to Antonito, Colorado to access the east end of the Rio de los Pinos near Ortiz and Los Pinos, New Mexico.